CRT operate with three different strategies that set the direction for each area. In addition, every year, CRT prepares an action plan for the application of the annual grant from The Ministry of Higher Education and Science (granted through The Regional Municipality of Bornholm). The strategy for 2019-2021 is under preparation. The business strategy Knowledge, growth and welfare 2015-2018 is the foundation of all other strategies. It describes the core of what we at CRT stands for and want to achieve with our work. To achieve our goals, we have also developed strategies for the areas of Research and Communication. Our annual report (published only in Danish) documents the results based on the three strategies. Organic growth through additional sales, new sales and increased productivity and efficiency with new jobs and activities on Bornholm as a result. Better coherence between research and use and consolidation of core business areas. More and better dissemination of research results. Greater communicative impact and competence. Improved contribution to knowledge-based development on Bornholm, among other things. through stronger collaboration with actors. Promote growth and development in peripheral and island areas. Strengthen culture and community at CRT and an active and co-operative board of directors. National knowledge center: CRT was born as a dedicated Bornholm institution, but now works throughout the country as well as internationally. Research in peripheral areas with a special focus on island issues: The research field is the specific structural challenges and solutions in a country’s peripheral areas. The core of comparative social science analysis: With model-based analyzes, deep scans and comparative analyzes of challenges and solution alternatives supplemented with a qualitative approach in case studies can be provided. Subcontracting strategy: The nature of the services, the limited size of the center and the location on Bornholm make the roles as research partner and sub-adviser our preferred market strategy. CRT provides research and advice in peripheral areas for use in strategy and policy development at local, regional, national and international level. CRT wants to be the preferred partner for municipalities, regions and national actors in creating new insights and new solutions for business and tourism development in peripheral areas and on islands in Denmark. We promise each other and our business partners to perform careful change. Careful because we are trustworthy and respectful. Change because we make a difference. We are trustworthy because we are scientists we follow and we do things properly. We are respectful because we listen, we are open to the professionalism and knowledge of others, and we are committed. We change because we dare to try something new and different, we dare to suggest what needs to be done and we can back it up. 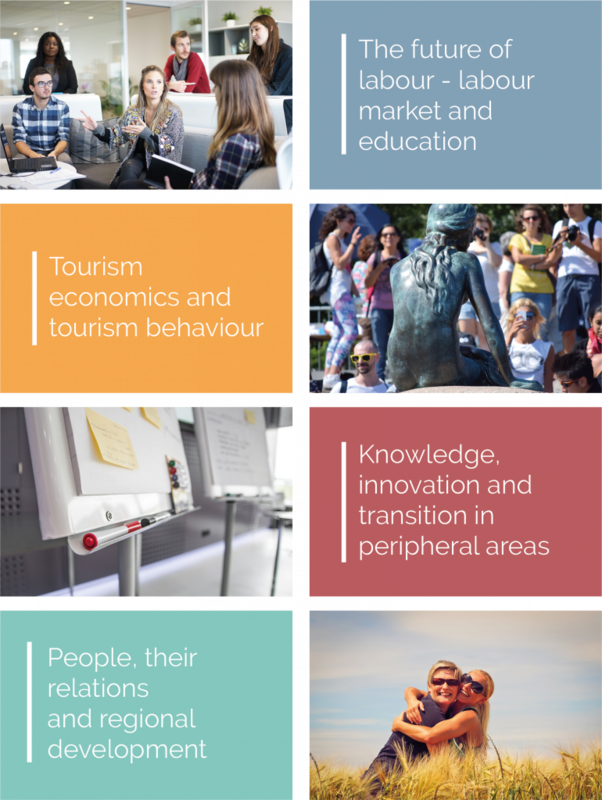 CRT’s research strategy ensures that we at all times focus on research areas that meet a social need, a market need or clarify important trends, and where CRT’s competencies can create careful change in terms of regional development and tourism. The research strategy includes four themes based on existing and expected future areas of competence and knowledge of societal needs, which at the same time constitute a market potential. The communication strategy helps us to ensure that we always communicate in accordance with our fundamental values ​​and purposes and that new knowledge finds its way to the right stakeholders. CRT’s communication strategy describes the foundation of the strategic decisions and defines selected areas where CRT focuses its efforts with the aim of achieving greater communicative impact and competence throughout the CRT. CRT’s biggest challenge is lack of knowledge of the center among our primary stakeholders. There is a need for greater communicative impact and competence and more and better knowledge dissemination. It requires focus and coherence in our communication activities. We need effective communication tools, and everyone at CRT needs to continually focus on developing their communicative skills. Finally, it requires a joint effort and an implementation plan that not only provides knowledge, tools, and motivation to change practices, but relates to everyday life and is adjusted to work well with existing processes and strategies. This means that in everyday life we ​​have to go down to earth and uncover what keeps us from following the strategy in practice. For example, are our templates user-friendly enough, so it is easy for the individual to contribute to the goal of a uniform expression in our publications and dissemination? Is there enough time to carry out the fixed steps defined in the strategy? In order to create focus and coherence in the communication activities and achieve greater communicative impact and competence, we have made strategic choices about what means, processes and actions we apply and how. prepare communication plans for all relevant projects so that communication is considered from the start. enter debates that lie within our expertise, which have a quantitative/qualitative profiling potential and where we have opportunity to apply nuances, give an overview and/or minimize misunderstandings. make sure that we are present in relevant networks within our areas of expertise. continually seek new ways to convey our knowledge so that it is usable and easy to translate into action for our primary audiences.